Summary: An olfactory display is a device which provides various scents to a user. We tried to reduce the odorant spreads into the ambient by installing the air intake and inner deodorant filter. 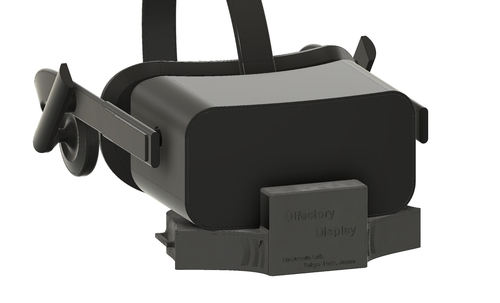 Based on the method, we include olfaction in VR games to provide the remarkable sensation to a user. Shingo Kato is currently pursuing the M.E. degree with the Tokyo Institute of Technology, Tokyo, Japan. Summary: A new projection mapping technology for foods is demonstrated. The technology is based on edible retroreflectors that are optical devices made from edible foodstuff. 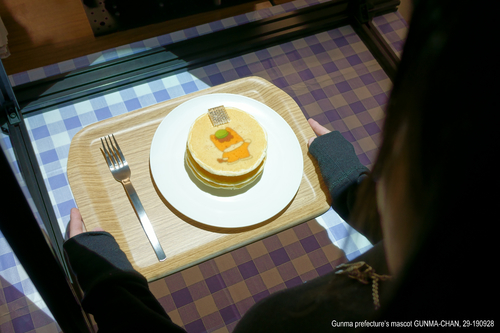 Since visual recognition of the retroreflectors is simple and stable, projection mapping on foods can be installed easily and effectively. Hiromasa Oku received the B.S. in Physics, 1998, and the M.Eng. and Dr.Eng. degrees in Mathematical Engineering and Information Physics, in 2000, and 2003, respectively, from the University of Tokyo, Japan. He had been a Research Associate, Assistant Professor and a Lecturer at the University of Tokyo. Since 2014, he has been an Associate Professor at the Gunma University, Gunma, Japan. His current research interests include dynamic image control that is to provide adequate visual information to a human in a comprehensible and intelligible way by the control of optics, illuminations, and image processing. Summary: Attendee interacts with FacePush system through two applications. She/he stands at the center of our floor plan and starts experiencing our game with haptic feedback provided by FacePush. Attendee has to wear wrist straps on both hands in the second application. I am a master student at the Multimedia Engineering Institute of National Chiao Tung University. Summary: We propose breathing with gills simulate system Gill+Man. This system can be presenting sense of breathing through gills likefish. Gill+Man system is consisting 3 devices, breath sensing device, SSPD(Swallowing Sense Presenting Device) and GSPD(Gill Sense Presenting Device). These devices use simple stimulation and compound for make gills sense. Izumi MIZOGUCHI is a first year PhD course student at University of electro-communications(UEC). He is researching Virtual Reality and Human Augmentation. He obtained Master of Engineering at UEC in 2018, and Bachelor of Computer Science at Tokyo University of Technology(TUT) in 2016. He researched Smart Shoes and foot movement for Human augmentation in Bachelor to Master. 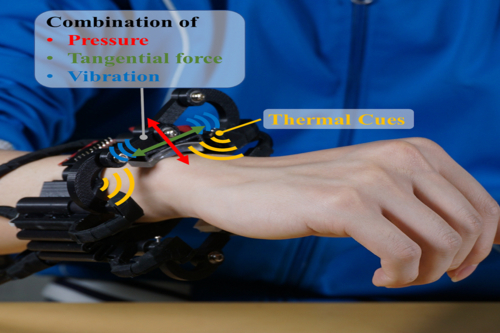 Summary: We developed a device presents the haptic sensation of the fingertip to the forearm rather than to the fingertip for objects in virtual reality environment. The device adopts a five-bar linkage mechanism and Peltier elements, presents the strength, direction of a force, vibration and the thermal sensation to the forearm. 2nd Master course student. Taha. K. Moriyama, Kajimoto-Laboratory, Department of Informatics, The University of Electro-Communications. Born in Egypt and studied most of life in Germany. 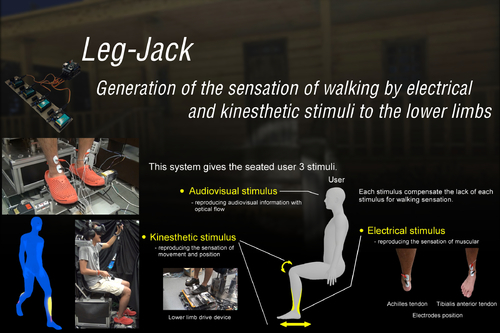 Summary: Leg-Jack is a neurosensory and kinesthetic stimulation system that combines an electrical stimulus applied to tendons, a kinesthetic stimulus to the lower limb, and an audio-visual stimulus to impart a walking sensation to a seated user. The combination of these stimuli significantly increased the subjective ratings of the walking sensation. Hirofumi Kaneko is a master's degree student at Tokyo Metropolitan University. He obtained the bachelor degree in mechanical system engineering from Tokyo Metropolitan in 2016. His research interests include development of electrical haptic display, virtual reality and ultra reality. 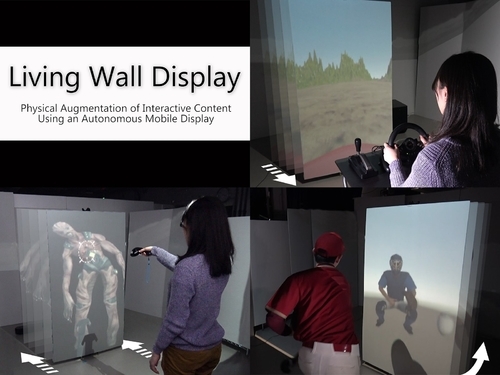 Summary: We propose the Living Wall Display, a new way of physically augmenting animated interactive visual content using moving display. Its movements are coupled with the underlying content animation via interactions, providing stronger depth perception effect (e.g., pseudo force) and increases the sense of presence of the screen content. Summary: We propose a mid-air display system, called “Luciola”, which can draw characters and acts as a moving micro lamp in mid-air. It combines acoustic levitation with focused ultrasonic sound and wireless powering with magnetic resonant coupling. 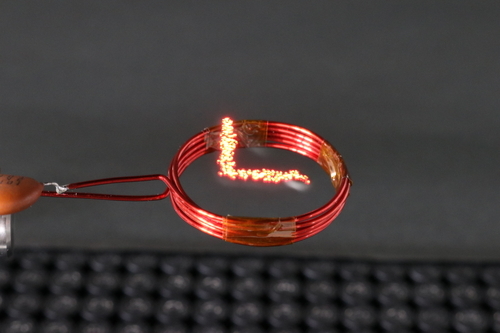 A custom IC in levitated particle is designed to reduce its size and weight. Hao Qiu received the Ph.D. degree in electrical engineering from The University of Tokyo in 2016. After graduation, he has been a project researcher in The University of Tokyo. His research interest covers from materials, devices, to circuits. His present emphasis is circuit design for wireless power transfer and wireless communication systems for IoT applications. He served as the research fellow in Japan Society for the Promotion of Science (JSPS) from 2015 to 2017 and the representative in Japan Society of Applied Physics (JSAP) from 2016 and 2018. He was the recipient of 2016 IEEE EDS Japan Chapter Student Award. Summary: We propose a multilayered 3D zoetrope called the “Magic Zoetrope”, which makes it possible to animate two independent object groups concurrently and to represent various alterations in the animation, unlike a conventional 3D zoetrope which presents the periodic and unchanged animation. In 2018, he completed master's course of Graduate School of Fundamental Science and Engineering, Waseda University. He is a Master of Engineering. Summary: We propose a very simple rapid prototyping method of haptic interfaces for touch devices. The sheet-like interface for a capacitive touch screen is composed of magnetic rubber sheets and conductive materials. 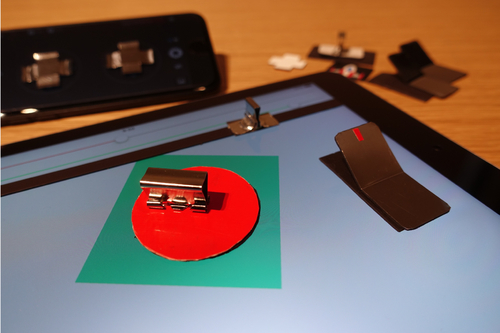 Moreover, using a magnetizing toolkit, the haptic feedback can be changed within seconds. Dr. Kentaro Yasu is a creative researcher at NTT Communication Science Laboratories. Ph.D. (Media Design). He received a Bachelor of Engineering in 2008, a Master of Media Design in 2010, and Ph.D. in 2013 at Keio University. He has started research activities at NTT Corporation since April 2016. He is developing creative tools and interactive techniques using familiar materials and equipment, such as automatic origami using microwave ovens and haptic systems using permanent magnets. His research project appeared in CHI, SIGGRAPH studio, and his installation appeared at Ars Electronica. 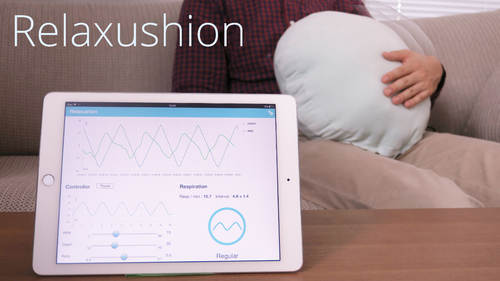 Summary: "Relaxushion" is cushion shaped device which enables us to control breath unconsciously by overwriting somatic sensation of our breathing. By embracing this device, we get a cushion’s motion confused with our breathing motion. This illusion strongly modifies our breathing rhythms and helps us to become relaxed state. Yuki Ban received the M.S. degree and the Ph.D. degree in Information Science and Technology from the University of Tokyo, Tokyo, Japan, in 2013 and 2016, respectively. He was a researcher at Xcoo inc. research from 2016 to 2017. He is currently a Project Assistant Professor of Department of Mechanical Engineering at the University of Tokyo. His current research interests focus on modifying spatial perception using the visuo-haptic interaction. 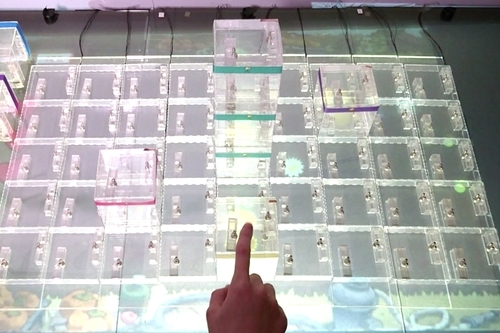 Summary: RFIDesk is an interactive surface that enables both multi-touch and rich-ID stackable tangible interactions. It uses ultra-high frequency (UHF) radio-frequency identification (RFID) for recognizing the rich-ID stacking of tangible blocks and integrates indium tin oxide (ITO) for capacitive multi-touch detection while preserving the interface transparency. Meng-Ju Hsieh is a Ph.D. Candidate at the National Taiwan University. He received his master in the Department of Computer Science from National Tsing Hua University. His major research interests are Human-Computer Interaction, with a specific focus on tangible interaction and wireless sensing. Summary: The purpose of this installation is to demonstrate novel perceptual effects in which the compelling illusion of depth and transparency for paper materials is induced by the conventional light projection of cast shadow patterns. The audience can interactively enjoy experiences wherein objects and letters on a paper perceptually float up. Takahiro Kawabe is a senior research scientist, Sensory Representation Group, Human Information Science Laboratories, NTT Communication Science Laboratories. He received a Doctor of Psychology from Kyushu University, Fukuoka, in 2005. In 2011, he joined NTT Communication Science Laboratories, where he studies applied aspects of human perception. He received the 2013 JPA Award for International Contributions to Psychology: Award for Distinguished Early and Middle Career Contributions from the Japanese Psychological Association. In 2018, he was also awarded The Young Scientists’ Prize of The Commendation for Science and Technology by the Minister of Education, Culture, Sports, Science and Technology. 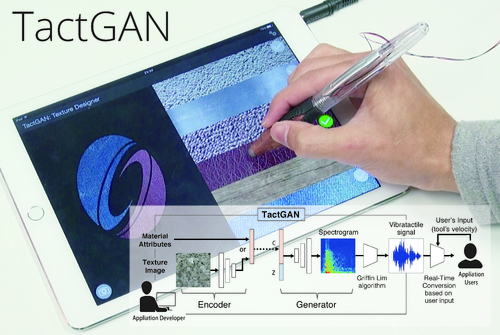 Summary: TactGAN helps us to design vibrotactile feedbacks rapidly. 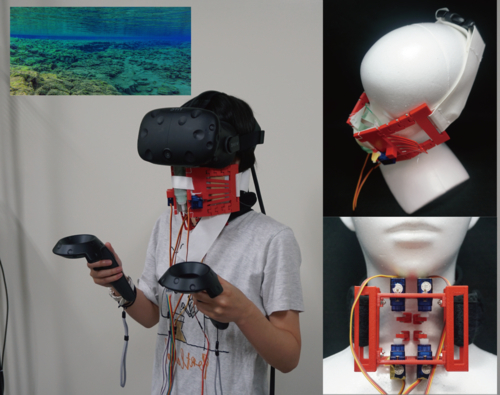 With this system, we can generate vibrotactile stimuli from images and user-defined attribute values such as material kinds or tactile words. We can design vibrotactile feedback on the touchscreen while touching and comparing the generated stimuli. Yusuke Ujitoko is a researcher at Hitachi, Ltd., Japan. He received a B.E. degree in mechanical engineering and M.A.E. degree in inter-disciplinary information studies from the University of Tokyo, Japan, in 2014 and 2016. His research interests include applied haptic perception and haptic interfaces. 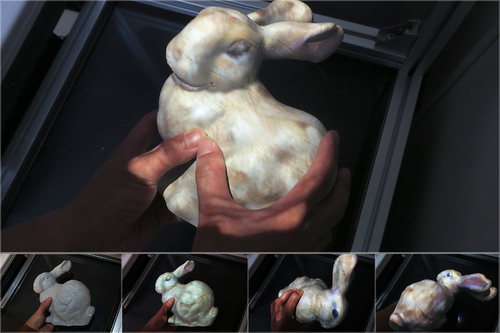 Summary: “Tangible Projection Mapping” is dynamic appearance augmentation to object in user’s hands. This technique allows users to hold a target object freely and augments appearance of that in various postures by user’s manipulation. It can provide a deep sense of unity with the attractively enhanced object in hands. Yuki Morikubo is currently a master-course student at the Graduate School of Informatics and Engineering, the University of Electro-Communications. He received a bachelor’s degree of Engineering from the same university in 2018. His research interests include virtual reality, image projection techniques, interactive media techniques and human-machine interface. He is a member of ACM SIGGRAPH and the Virtual Reality Society of Japan. Eugene San Lorenzo is currently an undergraduate student at the Faculty of Informatics and Engineering, the University of Electro-Communications. His research interests include virtual reality, image projection techniques, interactive media techniques and human-machine interface. Daiki Miyazaki is currently a master-course student at the Graduate School of Informatics and Engineering, the University of Electro-Communications. His research interests include computer vision, virtual reality, image projection techniques, interactive media techniques and human-machine interface. Naoki Hashimoto is currently an associate professor at the Graduate School of Informatics and Engineering, the University of Electro-Communications. He received a Doctor of Engineering from Tokyo Institute of Technology in 2001. His research interests include virtual reality, image projection techniques, interactive media techniques and human-machine interface. He is a member of ACM SIGGRAPH, the Institute of Electronics, Information and Communication Engineers, the Virtual Reality Society of Japan, and the Institute of Image Information and Television Engineers. 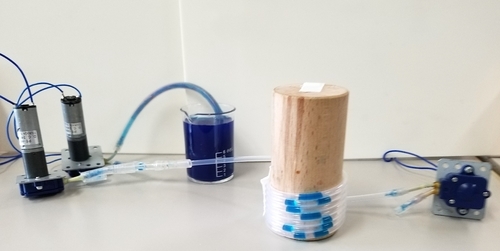 Summary: We propose a novel tube display TuVe, that consists of a tube and fluids inside of it to show information, while offering a shape-changing display. Thus, only the tube constitutes the display part, and it enables users to easily maintain, replace, and change its size or shape. Yuki Inoue is a master course student of Graduate School of Information Science and Technology, Osaka University, Japan. His research interest is developing new type of displays with natural things like water drops. Dr. Yuichi Itoh is currently an associate professor at the graduate school of information science and technology at Osaka University, Japan. He received his B.E, M.E, and Ph.D. degrees from Osaka University in 1998, 2000, and 2006 respectively. His research interests include developing emerging and novel devices to enhance users’ daily life and realize intuitive interactions with computers. 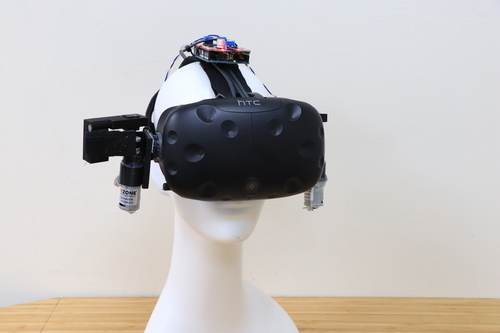 In addition, he is working on realizing unconscious computing to support users by combining various sensors, human-internal models and ambient displays. Takao Onoye received Dr.Eng. degree in information systems engineering from Osaka University, Japan, in 1997. He joined Osaka University as a research associate in 1993, and promoted as a lecturer in 1998. Since 1999 through 2002, he was with Kyoto University as an associate professor. He is currently a professor of the Department of Information Systems Engineering, Osaka University. His research interests include System-on-a-Chip implementation of multimedia (audiovisual) processing system. Dr. Onoye is a member of IEEE, IEICE, IPSJ, and ITE of Japan. 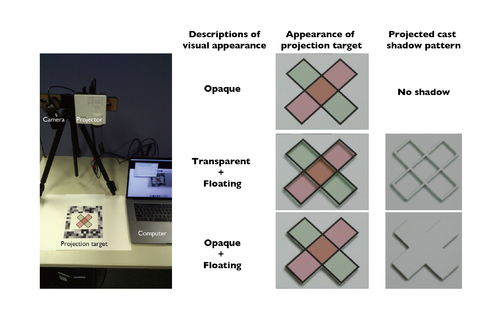 Summary: This paper proposes VarioLight: a method for realizing dynamic projection mapping (DPM) onto a widely moving and finely deforming/rotating object, by combining a high-speed/low-latency projector and a mirror-based high-speed optical axis controller. It realized DPM applications such as projection sticking even to highly dynamic object and visualization of its dynamics. Graduated from Department of Information Physics, Faculty of Engineering, University of Tokyo in 2018. Member of The Virtual Reality Society of Japan. 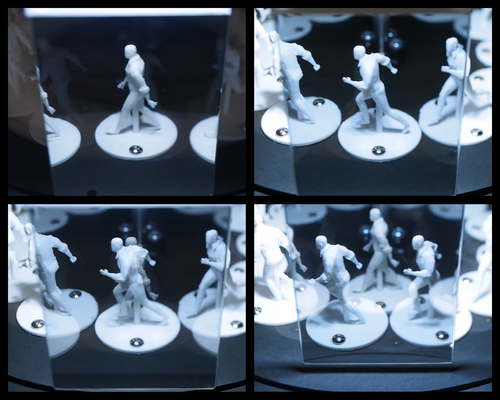 My research is about Dynamic Projection Mapping and Dynamic Fabrication. Interested in Mixed Reality, Augmented Reality, Image Processing and Recognition, High-Speed Optical Axis Control. Summary: Xpression, a mobile application allows user to transfer facial expression on other people's faces in video and images. Unlike other reenactment works, our method works instantly on video as well as still images on mobile device and is freely available on iOS App Store. Worked at Yahoo! Japan before establishing EmbodyMe, Inc. Throughout my career, I have been involved in research and development in areas such as computer vision, computer graphics, and machine learning. I have launched multiple services for smartphones that applied advanced technologies as a global pioneer. Toby is an 4th year UG student in University of Tokyo, Department of Electronic and Electrical engineering, supervised by Prof. Koji Yatani at IIS. He also works as assistant researcher in Igarashi CREST and researcher in EmbodyMe Inc. Passionate in Machine Learning, Human Computer Interaction, Computer Graphics / Vision.